Focus is something that comes up a lot! People are constantly asking me about what essential can help with focus. Sometimes it's for people to help them with their work day, or for others it's for their children. I wanted to highlight some of my favorite roller bottle blends and diffuser combos as well as some of my favorite essential oils that help support focus. This is my new favorite Focus Roller Bottle Combo. This combo is great for anyone for focus challenges, however it might not be my number one choice if someone is dealing with hyper activity. This blend is simple to make. Simply apply to the back of the neck and/or behind the ears as needed. Need something to help more with hyper active kiddos? 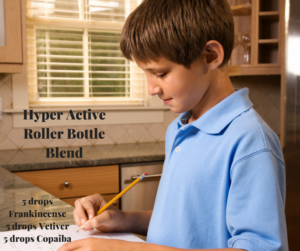 Try this roller bottle blend! Apply to the back of their neck at the base of their hairline to help support focus and calmness. Reapply as needed. Don't want to make your own? Give doTERRA's InTune, the Focus blend a try! This is combination of Amyris Bark, Patchouli Leaf, Frankincense Resin, Lime Peel, Ylang Ylang Flower, Hawaiian Sandalwood, and Roman Chamomile Flower. Diffusing essential oils is another great way to use them to help with focus! This is one of my favorite simple combinations. Simply add 2 drops of Wild Orange and one of Peppermint to the diffuser and enjoy. This combo is both energizing and centering. Great for after school or when completing a tedious project. Another great combo is Rosemary, Grapefruit and Peppermint. This combo can help with mental fatigue, memory, energy and focus. It is a power combo to diffuse during those long days or when homework seems like mount everest. Did you know that Basil can help to reduce excitability while promoting calmness and allowing the brain to focus? Cool right? Try out this combo of Lemongrass and Basil to help focus. Rosemary is energizing and stimulating to the central nervous system. It can help with mental fatigue and even support memory. Basil can help calm the mind while improving focus. It also helps to boost your self esteem! Peppermint Essential oil helps to improve circulation to our central nervous system, give us a natural energy boom and help with focus. Great for when you are feeling tired, but still need to focus! Vetiver has been shown to calm the mind and circling thoughts while decrease hyperactive behavior by supporting a sense a of calmness in the body.